Everybody needs hand tools, and when you think of hand tools, one iconic brand pops to mind: Stanley. Stanley has been making tools since 1843, along the way being responsible for creating some prototypical tools: the utility knife and the Yankee screwdriver, for example. The utility knife is even known as the Stanley knife in the UK, Australia, and New Zealand, another example of a trade name being taken over to refer to a class of products. But we digress! Stanley is today making some of the best hand tools on the market. After all, they’ve had 175 years of practice! We think they’ve gotten it right, and so does most of the world. That’s why we’re bringing you a review of the best Stanley hand tools. 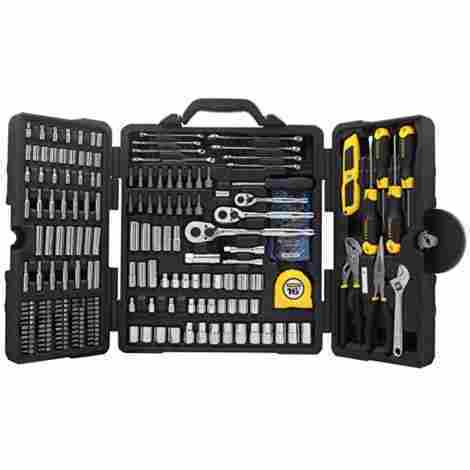 The Stanley 73795 210-piece tool set has everything you need to handle most mechanical and home repair tasks. Everything from that Stanley icon, the utility knife, to 1/4, 3/8, and 1/2-inch sockets and ratchet handles, screwdrivers, hex wrenches, a measuring tape, and pliers. There's not much more you'll need if you start with this awesome kit! This home and mechanic's tool set has everything you need to get through most jobs you can think of. A nice chrome-vanadium steel wrench and socket set is nicely complemented by arc-joint and needle-nose pliers, screwdrivers, hex wrenches and even a measuring tape. The whole set comes in a handy blow-molded plastic case that provides storage and retention for everything. The beautiful heavy chrome finish on the wrenches means they are easy to clean and will last for years. Looking over the contents of this toolset, the question should be, "What can't you do?" As we checked it over in the garage, we saw there was very little in the way of routine maintenance on the average passenger car that you could not do with these tools. Oil changes, battery maintenance, even brake pads and rotors, everything you need is here. We just changed out a variable valve timing solenoid on a 4-cylinder GM engine, and everything tool you'd need is right here. Don't worry that you'll be short that one critical tool! You'll want a few others if you're starting from scratch, but this is a great basic set. This Stanley tool set is a strong value at the price we see in the marketplace, less than you'd pay for an oil change in many shops. With the thoughtful selection of tools included, it's an excellent deal. We would not hesitate to buy one of these. In fact, if you are already well-equipped in your home garage, this would make a great grab-and-go second set to keep in your RV, or with your ATV/snowmobile trailer! You don't know what might happen on the road, and you'll be equipped and ready to handle whatever comes your way! For the mechanics at heart, the Stanley 71652 socket set is 123 pieces of chrome-plated steel heaven. Not only does it have SAE and metric sockets, in both 1/4 and 3/8-inch drive, it includes SAE and metric hex wrenches, a nut driver handle, and a set of screwdriver bits to fit almost any fastener you come across. This says it's a socket set, and indeed it is. Containing both SAE and metric sizes, plus 1/4 and 3/8-inch drive ratchet handles, this set will meet the vast majority of your needs. In fact, we have one of these sets in our RV, covering our needs when we're on the road. It's great for that exact purpose, being an extra set to keep in the car or camper for those emergency needs. If you are just starting out on that great journey of building a set of tools, this is a wonderful place to begin. You'll love the look and feel of the heavy chrome plating over chrome-vanadium forged tool steel. You will find you do need a few more things to fill out your arsenal, but, heck yeah, this will get you going. And hey, we are reviewing a bunch of other fine Stanley tools on this list, so why not build your wish list right here? 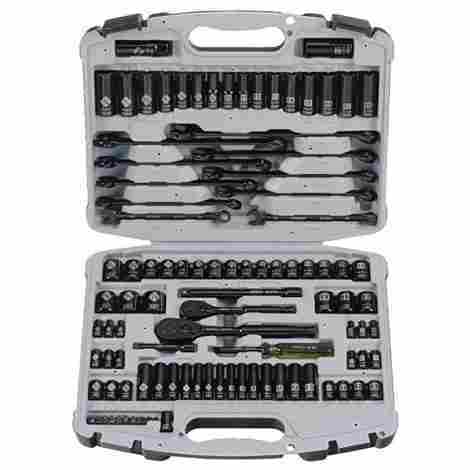 This set comes in at a very reasonable price-point; in fact, we made an office run to the local designer coffee shop today, and the total tab for that was more than what you'd pay for the Stanley 71652 socket set. We'd call that a good deal since your caramel macchiato is long gone, but these tools will be with us for years to come. The Stanley 92-839 Black Chrome socket set is a 99-piece tool collection that includes all the usual suspects: SAE and metric sockets, 1/4 and 3/8-inch drive ratchet handle, and both SAE and metric combination wrenches. But, and this is a big but, it is finished in sleek black chrome, with big, easy-to-read laser-etched markings. No squinting to figure these guys out, it's right there, bold and beautiful. This is a socket set that can only be described as sensuous. Silky smooth black chrome at your fingertips makes us feel relaxed and wonderful. Just owning these makes you feel like you could build a steam locomotive out of old tin cans and a few nuts and bolts. They are absolutely gorgeous. They are, however, also as practical as they are attractive. You can slap one on a bolt, and have it loosened (or tightened) in no time, even in the tightest quarters, with the 72-tooth ratchet handle. Do yourself a favor, put this Stanley socket set on your wish list, maybe someone will be extra kind to you this year! There's a lot more to this socket set than just good looks, of course. Both SAE and metric sizes to cover all your needs, naturally. Sparkplug sockets in the most common sizes, extension bars, and the combination wrench set, all crafted of the standard chrome-vanadium steel before being coated in the lovely corrosion-resistant black chrome. Then it's all packed in a contrasting grey case that holds each tool securely in its place, ready for you to call upon it in its turn. For all its attractiveness and practicality, this Stanley socket set rolls in just about where you'd expect to find a nice socket set. You'll not feel any pain at the cash register when you check out with this set in your cart. You will feel some serious happiness when you get it in your garage and unpack each socket, wrench, and accessory. I would not hesitate for a second to choose the Stanley 92-839 Black Chrome socket set for my collection. Beauty and functionality are two attributes that come together all too rarely, but they have here. This Stanley 84-058 Pliers Set includes one each of slip joint, diagonal cutters, lineman's, and long nose pliers, drop forged from durable chrome-vanadium steel before being machined and polished into the smooth cutting and grasping tools you see here. Attractive non-slip handles in trademark black and yellow Stanley colors round out the design of these excellent tools. Here in our garage, the most frequent thing we find ourselves reaching for is a pair of pliers. Whether you are going after a lost nut, cutting wire, grasping a bolt, crimping a terminal, or tightening a cable tie, we are constantly looking for pliers. Isn't that why most of us have a multitool on our belt? I know that's why we do! 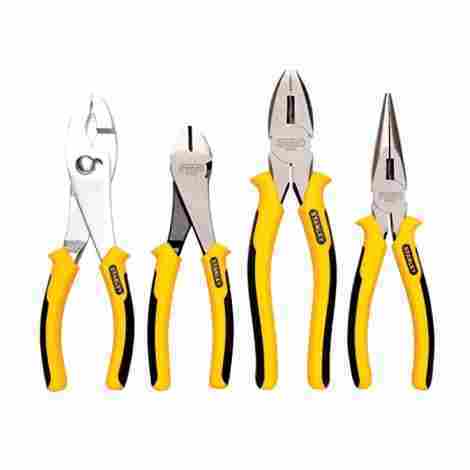 So our next selection on this list of Stanley tools is this plier set. We have to admit that this list is not really ranked in order of quality. All these tools are good, they are just different tools. Stanley makes a lot of good stuff, so as we thought about how to set up a list of tools, we thought we'd put them in the order we'd buy them if we were stocking the garage from scratch. The first three give you a range of sets to choose from, but from here on, you need all of this. So we had a meeting around the workbench one afternoon, and came up with this list, in the order you see. It's all excellent quality, first-rate equipment. The cost is moderate here, less than taking the family out for fast food hamburgers, for sure. These pliers are each a necessity in their own right, and they are beautiful executions of the toolmaker's trade. You can't go wrong in any way, shape or form with this set of pliers, and you will use them every time you take on a new job in your garage, and around your home. The Stanley 91-541 Cushion Grip Screwdriver Set has eight, yes, eight, of that common tool you always need, every day: the humble screwdriver. There are 4 Phillips (#0, #1, #2, and #3) and 4 flat blades (1/8-inch, 3/16-inch, 1/4-inch, and 5/16-inch) examples in this set. You won't be short of screwdrivers with the collection at home! OK, admit it, about half the time you don't use a screwdriver as a screwdriver, do you? It's a scraper, a punch, a pry bar, an alignment tool, or any of a hundred other uses not involving screws. We do not recommend any of these uses, there being specific tools to accomplish each function, many of which are reviewed on this page! But we know in our hearts it's going to happen, which is why we recommend buying the best screwdrivers you can. That's why we like this set. That, and you need a good set of screwdrivers in the garage anyway, right? This one fits the bill. This set has four of both Phillips and regular slot-style screwdrivers. Always make sure to match the screwdriver you are using to the screw. The better the fit, the less chance of slipping or damaging either the screw or the screwdriver. Especially the Phillips sizes, which many people think are interchangeable, just larger or smaller. They are not. The taper of each is a little different. You can feel the good fit you get with the right size screwdriver. This set has a good range, so you'll be able to fit the screwdriver to the task, and you'll be happier and enjoy your work, rather than dreading it! This set will cost you no more than three or four bucks for each screwdriver in the set, and that is a good deal. The range of sizes and the easy-on-the-hand cushioned grip make them well worth the asking price. The shafts are durable forged steel, the same material as the other quality Stanley tools we are reviewing here, this set will last and last. 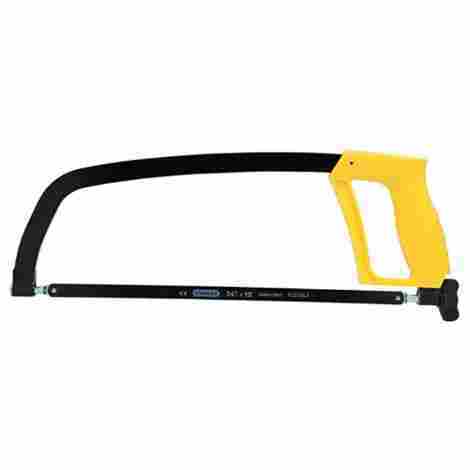 The Stanley 20138 Hacksaw accommodates standard 12-inch hacksaw blades. The curved frame allows a 4 3/8-inch cutting depth. A large, easy-to-turn tension knob allows changing and tightening blades quickly and easily. Sooner or later, you're going to be faced with a rusted bolt you just can't get off, or a battery terminal that's corroded into a single mass. It's time for one of the simplest yet most effective tools around, the humble hacksaw. A hacksaw is designed to hold a thin metal blade under tension, so it remains straight and easy to cut with under pressure. Hacksaws are designed for cutting metal, through a variety of blades are available, some for specialized tasks like cutting glass. We've used them for all sorts of tasks over the years, from cutting off frozen bolts to cutting metal plate to size while doing automotive bodywork. Stanley's entry, the 20138 Hacksaw, features a number of thoughtful design elements. A curved frame allows a 4 3/8-inch cutting depth. That's a big improvement, since a hacksaw that can't get all the way through what you want to cut, say, a big piece of an exhaust pipe, is a show stopper. The ergonomically designed handle allows repetitive sawing without unnecessary hand and arm fatigue. And a nice, big tension nut allows you to install and tighten blades without reaching for a pair of pliers, keeping you on task longer. This is probably the least expensive item in our shopping cart of Stanley tools. It's undeniably very effective at what it does, being an evolutionary approach to a tool that's been around for ages. It works, and it works well, with a few additional touches we really like. This is a great value in a nicely designed hacksaw. 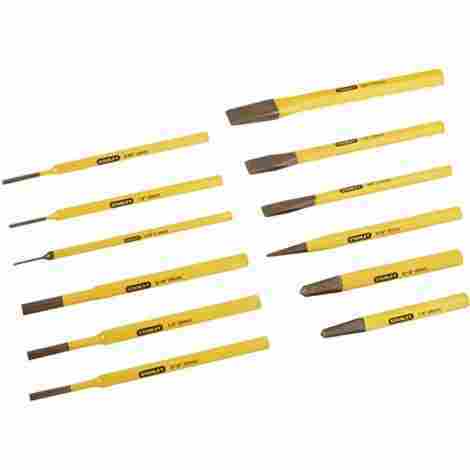 Here is the Stanley 16-299 Punch & Chisel Kit, a 12-piece set that includes 9 punches and 3 chisels. There are 6 simple round punches, two center punches, a nail set, and three metal-cutting chisels. You will have a hundred uses for all the included tools in this set! A little earlier, what did we say? You need a punch, or an alignment tool, or even a chisel, many of you reach for a screwdriver. Well, here, Stanley has set you up to have the things you need to do all those jobs without beating up your nice Stanley screwdrivers. A punch will drive out (or in) roll pins, help you remove knock-outs on electrical boxes or similar sheet metal items, and align parts during assembly, but before inserting fasteners. The center punches will, with a rap of a hammer, let you mark positions of drill holes on metal parts, and slightly dimple them, making for error-free hole placement and drilling. Then there are the chisels. Three of them. It's old school, but they are great for cutting metal or even stone. With hardened steel cutting edges, the three chisels in this set will cut through things fast. Always wear safety glasses! Flying chips from your job do not get along well with Mr. Eyeball! Sometimes the old school ways are the most simple and effective, and that is absolutely the case with these chisels. When nothing else can get the job done, grab a Stanley chisel cut to your heart's delight. The cost of this set is generally less than two dollars per included tool, and that, my friends, is an amazing bargain in the 21st century! This is a set of accessories that we needed in the garage, and so do you. You just need to go drop it your cart and check out today! There will be no regrets. The Stanley 87-471 10-Inch Adjustable Wrench is the latest incarnation of an iconic tool. 10 inches long for good leverage, this adjustable wrench's jaws will open up to about 1-1/4 inches. There is a laser-etched scale in both millimeters and fractional inches that read the setting directly. This wrench is made of chrome-plated, drop-forged chrome vanadium steel. Everyone needs one of these. Or two. When you were a kid, wasn't there one in the kitchen junk drawer? Unless your brother had already grabbed it to work on his bicycle, it was there. So why do we want you to get another one? This is a big 10-inch tool, allowing you to use a lot of leverage to break loose stubborn nuts and bolts. 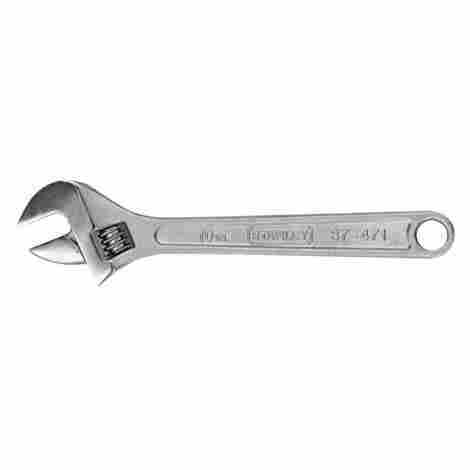 Most toolkits, even some on this review page, include an adjustable wrench, but they are usually smaller 6-inch size. Still super handy, but just not there to make your life easy. This bigger edition will get the job done with aplomb. Here's another thought: this would be a perfect addition to your road emergency kit! You can do everything from removing lug nuts to battery terminals with just this one tool. We have found ourselves on the side of the road in some backcountry area with nothing but our wits and what we have in the car to get us going again. Don't find yourself missing that one item that could conceivably save your life; get two of these, one for the garage and one for the car. It's a definite essential in the garage, a tool you can always grab and quickly deploy to help loosen or tighten nuts and bolts of any size, up to 1-1/4 inches. At the price point of this single tool, you cannot go wrong. As we said above, buy two! If nothing else, they'd be handy to work against each other, holding a bolt head with one while you tighten a nut with the other. That theory works with one of these adjustable wrenches, while performing tightening chores with your socket wrench. At any rate, we see these on the marketplace priced so you could pick one up, buy your favorite designer coffee on the way home, and still have changed from your twenty dollar bill. That's a nice price for an iconic, useful tool. A Stanley 54-716 16 oz Ball Peen Hammer is just what you need for, well, hammering things. As the name suggests, it is a 16-oz hammer, a good size but not unmanageable. A hardened steel striking face and an overstrike-protected graphite handle mean it's durable and strong. A hammer is the basic expression of humanity's goal to control our surroundings, bashing and smashing things to fit the vision of how we think things should be. It can also be the tool that gently taps things into alignment, loosens a recalcitrant nut, or works sheet metal into new and useful shapes. This Stanley 16-oz Ball peen hammer is a highly evolved expression of the hammer maker's art. 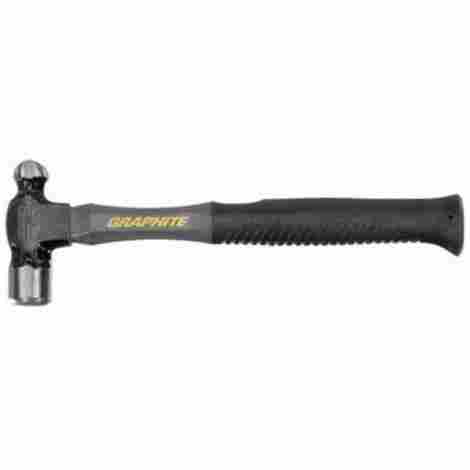 The hardened steel head resists deforming, while the overstrike-protected graphite handle promises years of trouble-free use. Overstike? And what's a peen? Overstrike is, well, when you swing and miss. It happens to the best of us. But when you miss and strike the handle, just below the head, on something solid, you can damage the handle... eventually badly enough that it will fail. There's nothing more heart-wrenching than a swing and miss with your hammer, then watching the head snap off and fly through your car's windshield. It's happened! So we highly recommend this Stanley tool with a very tough graphite handle, light in weight and with a high level of overstrike protection. Now, a peen is the rounded, ball-shaped end of the ball peen hammer. Peening is the act of hammering metal with that rounded end. It has the effect of inducing a stress pattern in the surface of the metal, resulting in its hardening. As you shape metal with the peen end, it is actually made more durable. Definitely, an ancient skill developed by blacksmiths, but modernized and delivered right to your hands in this fine tool! 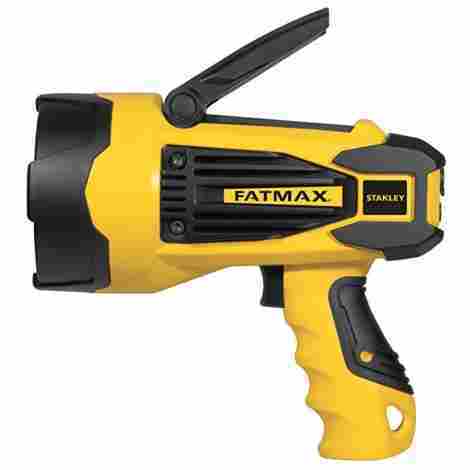 This is another very reasonably-priced tool in the Stanley lineup. We think this a wonderful bargain at its price point, and for such a universally useful tool. Years ago we bought one to shape sheet metal to replace the rusted out floor of an International pickup truck; that hammer is still going strong and one of the go-tos in our shop. Don't hesitate, complete your setup with one of these today! Here comes the Stanley SL10LEDS Rechargeable Flashlight. It's a little different from what you think of when you think tool, but you can have all the tools in the world, and none will do you any good if you can't see what you're doing! This battery-powered, rechargeable light uses a 10-watt ultra-bright LED to throw 920 lumens of light on the job. It's got a retractable handle for hands-free operation, and it's even got a USB port to charge your phone in an emergency. We've all been trying to work under a car, or even under the hood on a cloudy day, and you just can't see what you're doing in the darkness. Plus, you can't always work at home during the day! Enter the Stanley SL10LEDS Rechargeable Flashlight. You can place a bright 920 lumens on your work, with a retractable stand to make it hands-free. And, it's rechargeable, with both AC and DC cords included charging in the house or in the truck. Well, how about that! The Stanley rechargeable light even has a USB port you can plug your phone in to charge. If you're in the field, getting towards the end of a long day, and your phone is dying (can't have that in the 21st century! ), you can breathe life back into it by plugging into your flashlight! That's an awesome feature! We also like the versatility of the flashlight in how it can be charged in home, shop, or vehicle. It'll light your way anytime, anywhere. This is a well-designed, functional and useful tool at a very reasonable price. Add that all up and it spells value. This light is well worth every penny. This is criterion number one in our book. If a tool is not easy to use, it will quickly find its way to the bottom of your toolbox among the rusty screws, hardened tubes of goop, candy bar wrappers, and the other detritus of the working person’s life. And, that, dear friends, is a waste of time and money. Buying anything that doesn’t do its job does your family budget a huge disservice and leaves you feeling a little hollow and empty. Avoid that empty feeling by following our recommendations and buying good quality, easy-to-use tools. We’ve all bought something that turned out to be not the best. That combined pepper mill/garlic press that looked so cool in the gourmet store ends up being donated to the thrift store because it’s just not as useful as it appeared at first blush. That’s why we stuck to the basics on our list of Stanley tools. They will serve you well through years of use. In your decision-making, we looked to those tools that are universally useful across your home, garage, and on the road. Basic tools are like the basics of your office life. Stapler, three hole punch, scanner, computer monitor: all basic items that require little or no embellishment to do what they do in a competent manner. Likewise hand tools. If you look for the basics, you’ll find yourself with the most useful version of standard tools that have existed for hundreds, in some cases thousands of years. Don’t worry, be useful! A durable tool is a tool that will last for years, and spread its cost over that time. If your master mechanic’s tool set lasts you thirty years, divide that cost by thirty, and you can see your quality tools cost you only a few dollars a year. If something is not durable, it’ll leave you a little angry at the expenditure. Look, then, for quality in workmanship and materials. We don’t hesitate to recommend these hand tools from Stanley, a respected manufacturer of tools for many decades. Look at the heavy chrome anti-corrosion coatings, the fine chrome-vanadium tool steel material, the graphite handles, the machined jaws, the hardened striking surfaces, and you’ll know you have a durable tool in your hand. Value is the final and strongest attribute we look for at Drivrzone, bundling all these factors together to find the best balance of cost, quality, and durability. We found just that with the Stanley line of hand tools. We are certain you’ll agree, when you populate your toolbox with these great tools and accessories from Stanley! Q: Do these tools come with a warranty? A: Yes they do! Stanley mechanic’s tools (wrenches, sockets, ratchets and drive accessories) come with a full lifetime warranty. Call Stanley, and they will send you a replacement if your tool fails for any reason. Other hand tools have a limited lifetime warranty; Stanley will replace them as long as they are used correctly and not abused. Tools with electronic components have either a one- or a two-year warranty, dependent on the specific tool. Q: Can tools be recycled once they reach the end of their life? A: Of course. You should be able to recycle most old tools with any recycler that accepts ferrous materials. Stanley actually maintains a recycling facility in Towson, Maryland, where you can mail tools to be recycled if you choose that option. Check the Stanley website for current details. Q: What’s the difference between regular chrome plating and black chrome? A: From a protection and anti-corrosion perspective, nothing. Both are strong and beautiful, making your tools smooth and easy to clean. The black chrome process simply adds a few trace metals by alloying them with the chromium deposit. The end result is the attractive, lustrous black chrome finish.